In my year 7 classes at the start of every year, it’s a sad truth that not all of them know their times tables off by heart. By not having this basic building block, problem-solving later on in maths is always going to be light on solving and big on problems. Rather than hoping the problem would go away, I set out to fix it. Now, I don’t say this much but there is a place for repetitive practise as a teaching tool (so long as it’s engaging…see here) and, when combined with other methods too, mastery of times tables is well suited to practising and practising. In my mixed-ability year 7 classes, I knew some of my pupils already had rapid times table recall at the start of the year while others could take anywhere up to 15 seconds per question. So I started looking for a way for pupils to enjoy drilling their times tables every day. That posed a challenge – how to make it interesting and fun for all of them, irrespective of their current speed. Pupils would get daily practice every week. They would focus on one particular times table for the entire week, starting with the 3s. Some weeks would review a few times tables at once. Questions had to involve division as well as multiplication. The speed with which they correctly answered questions was the thing I wanted to improve. A baseline speed compared to a ‘final’ speed many weeks later would show whether any progress had been made. The Plan was not sounding particularly fun until I was inspired by a colleague. Mazzle Dazzle, as I call her, used to go round calling everyone a ‘rockstar’ for a job well done. When she called me a rockstar one day, I was glowing inside for hours afterwards. Somehow it felt like more of an accolade than a compliment. And that’s how I wanted my pupils to feel. It turned out, the missing ingredients of fun were music and rewards. 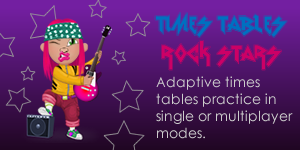 I realised pupils wanted to hear a bit of music in their lessons and be rewarded with a status or title, so I came up with the idea of pupils being known as ‘time tables rockstars’. Times tables rockstars, much like their musical counterparts, needed daily practice to get to the top and this analogy got me some early buy-in with the pupils. Over time, the other thing they started to share with real rock icons, was the excitement of performing well. Pupils enjoyed the feeling of getting faster and the self-adulation that began entering their consciousness. For some of them, they finally started feeling ‘worthy’ in the maths classroom. And so I continued to build around the rockstar analogy to propel and embed their excitement further. In time, some of them got so quick at their times tables that I had to create a new status, Rock God, for those answering in under one second! Times Tables Rock Stars is a 20 week programme and two year 7 cohorts at King Solomon Academy have now completed it, both with significant success. Above 90% of all pupils are Rock Stars or better by the end, compared to only 25% before the start. Other schools have adopted (and adapted) it too and from what I hear, their pupils are enjoying it and improving their times tables recall speed. I’ll be starting it again in September with a new batch of year 7s…I better get conjuring up some more fake rock names! See www.ttrockstars.com for more information. I’m a student and use it it is very good.